I was in the car the other day, I don’t know what for. It could have been one of a million things these days: driving the little girl to school, rushing to the grocery to grab some last minute item that we had somehow failed to notice was running low, bringing to the little boy to the pediatrician, going to one of my father’s doctors, off to the mall to buy school supplies and a new pair of soccer shoes for the hubs, hopping to a cozy neighborhood hidden gem of a restaurant to have lunch with the girls. Gosh, anything really. When did life become this busy? I’ve been almost 40 years on this Earth and every time I think this I can’t help feeling like adulthood just snuck up on me. I was in the car and I reached around the backseat for something and saw that the whole floor back there was covered in glitter. It was like a band of fairies had come and gone, and all that I had left to speculate their existence was this blanket of sparkling dust that marked their passing. At once I realized that the glitter was from my little girl’s ballet skirt…the white tulle one they were required to wear which was adorned with glitter that had no hope of surviving the rambunctious exertions of my 4-year-old. My first thought was, “how am I ever going to clean this up?” But then I paused, and smiled, and thought…why would I even want to? In a world too busy and much too fast, where all sorts of grown-up things pull you this way and that, like cyclones made of deadlines and reports and mortgage payments, why wouldn’t I want a little pixie dust in my ratty old (but very faithful) Honda? And I drove away, not touching even one shiny sliver, happy for both the wonder that a child can bring into your life and the little reminders that keep us believing in fairies and all sorts of magic. Even at the staid old age of almost-forty. Here’s something for the children in your lives…and for the inner child in us all. – Place chicken fillets, onion, and garlic in a pot and cover with the 7 cups of water. Bring to a boil and then lower to a simmer. Skim off any scum that comes to the surface. Season with salt and pepper. Let this cook for about 10-15 minutes or until chicken is cooked through. Remove chicken from the pot (leaving the broth) and set aside. – Add the carrots to the simmering broth and cook for about 5 minutes. Add the green beans and broccoli and cook until all the vegetables are tender, about 20 minutes. Taste and adjust seasoning if needed. – While the vegetables are cooking, shred the chicken meat. – When the vegetables are tender add the peas and alphabet pasta and cook for about 4 minutes more or until the pasta is done. You can choose to fish out the onion and the garlic at this point but I just leave them in. – Add the shredded chicken back to the pot, stir, then make one final taste for seasoning and take off the heat and serve. There is something about alphabets (pasta) that makes me just smile and feel like I may never grow up. It’s also something I love giving my kids. This is a very basic alphabet soup, with a chock-full of vegetables, that makes for a lovely, sustaining, healthful meal. You can mix the veggies around to include your family’s favorites, and leave out any they don’t care for. And of course, there is the whimsy, and educational value, of having letters in their soup! When making this, try to get all the vegetables cut to roughly the same size. You can serve this with a grating of parmesan cheese and a drizzle of extra virgin olive oil to top…or leave it as is, as I have done here. 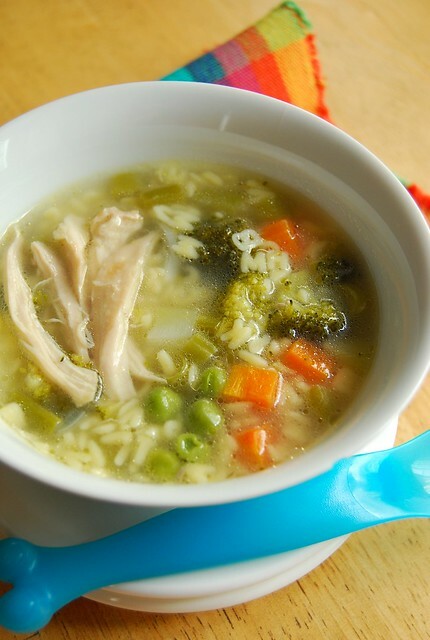 You can also use chicken stock instead of water to give the soup’s flavor more depth, but using plain water is just fine. You can also add a sprig of fresh herbs to the pot with the chicken, if you have any around. So…make sure to stop and marvel at the fairy dust. Relish each and every haphazardly placed ballerina sticker, found in odd places. Pause to live in the moment of made-up games and imaginary horses named Sparky. Childhood is fleeting, and so, in fact, is life. Enjoy the ride…and have a great week ahead! « The Asian Kitchen Cookbook Giveaway…We Have a Winner!! Lol… I had a similar experience once with fairy dust after a party we went to with the theme Gold… We were covered in glitter dust ourselves and I kept finding it everywhere for weeks after! Joey! This is so nice….. It was just like yesterday that I remember reading your post about being super excited to cook for your little girl! Time has flown by so quickly! And now you have two little ones!! Thank you for still blogging! 🙂 Like a chicken soup, I find your blog so comforting..
Hi Ling! Thanks! As far as parenting is concerned I think I am flying by the seat of my pants!